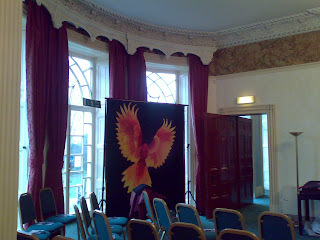 I have been trying to find time at home to post these pictures of last Sundays talk at Upton House, but I admit defeat so you will just have to see them in whatever order my phone decides on. Sorry. I think this has to be poshest venue I've spoken in. 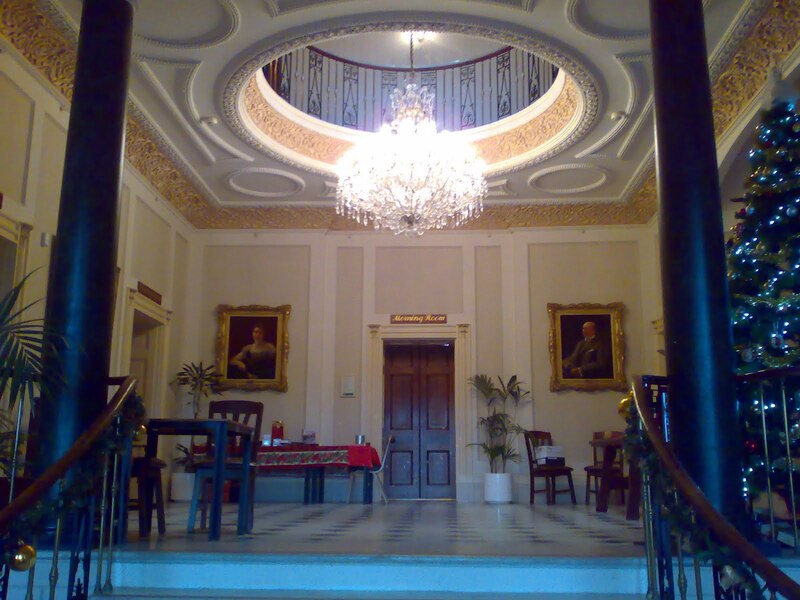 It is a magnificent house, if a very odd layout with strange shape rooms. Decorated it is very festive and has a lovely atmosphere. I haven't had a chance to reseach it's history but maybe google would help out if you are interested. 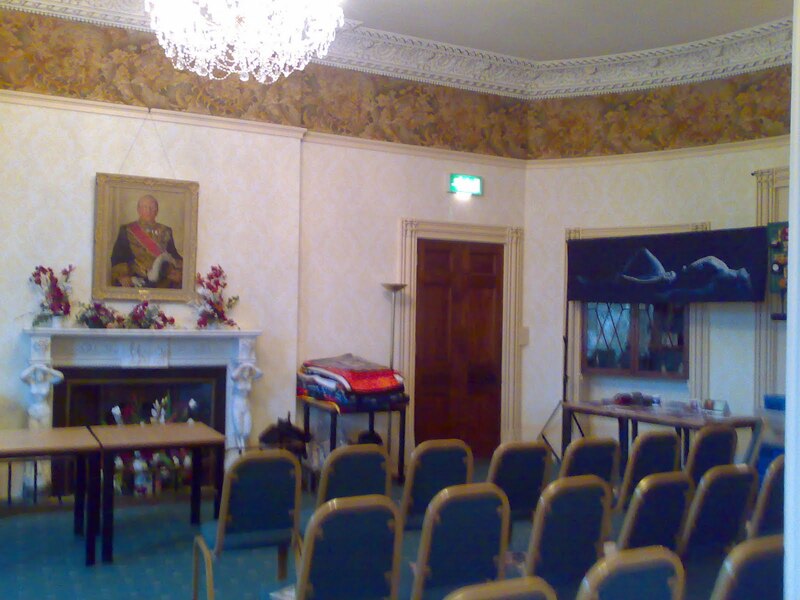 My talk was in the Drawing room in front of the magnificent fireplace. It meant I needed to come up with a new strategey for laying things out but we got there. 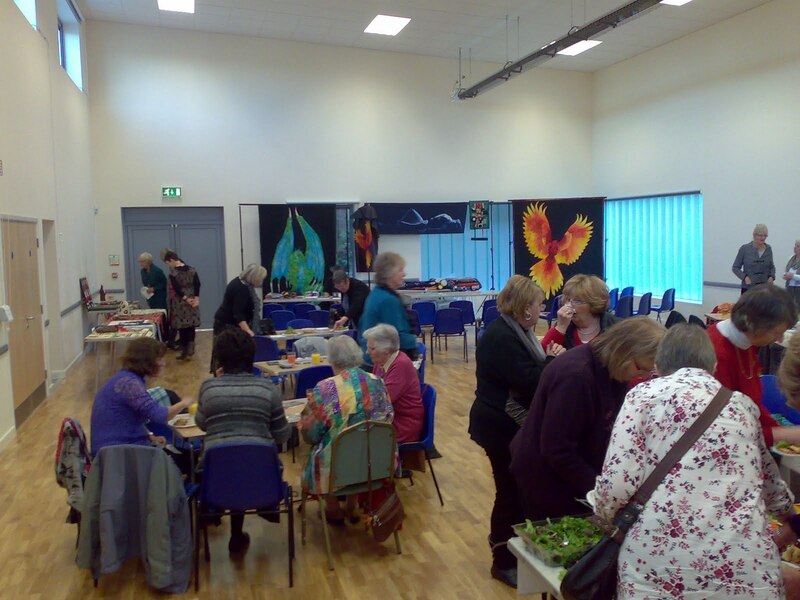 Fortunately the group offered helpers to look after the quilts as my tables were very spread out, and they made me up a plate of afternoon tea before the food all disapeared. It was a very good party. The weather played with us at paking up time, pouring with rain until we got the vehicles loaded then stopping. Still a bit of rain doesn't really hurt does it. I hoped to get to blogging last night but a good dinner, gin and tomic then a warm bed won out. Worthing Patchworkers were a dream to work with. We arriced and we offered tables refreshements and help. They didn't take offence when we turned down all but the tables. As we set up they started bringing out food, and we started worrying. There was a lot of food for not many tables. Quilt groups really know how to[ cater, and they won Tet over by having lots of fruit juice. It was another day when I got everything set up in time and could go and socialise, which really works well. We even got lunch. The whole day was low stress and easy, thank you so much for the patience while we packed. I do take a while toset up and pack, but I hope it's worth it. Having teased the chairman I have to mention her speach, it was fine if indeed short. Love the flamenco attention grabbing. Folks have been asking for pictues of the new van so while we were unloading and loadin I took some. Excuse the mess I am still not totally moved in. 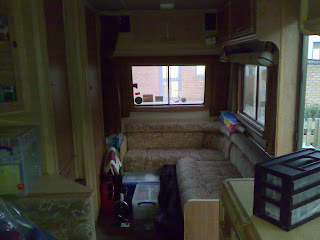 At the back of the van there is a corner sofa. I use this as a storage area when I am doing talks. Every thing fits neatly in there and still leaves me access to the bathroom which is to the other side of the rear of the van. Then there is the wardrobe and central heating, I love the heating. 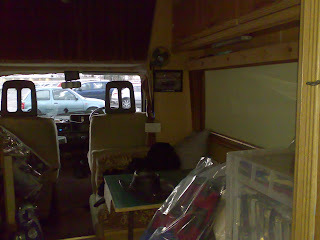 In the middle of the van is the saloon with the table and chairs, my prefered spot to relax, I can sew or rad or anything else I fancy there. Next to that is the kitchen with the cooker, grill, oven, sink and fridge. It's nice beimng able to make tea without moving :) Finally over the cab is my bedroom. Yes it's high up and you have a ladder to get into bed, but it's warm and it's always ready to use. I know I am lazy and after a talk I wouldn't make up a bed, with this I don't have to I just get in, simple. 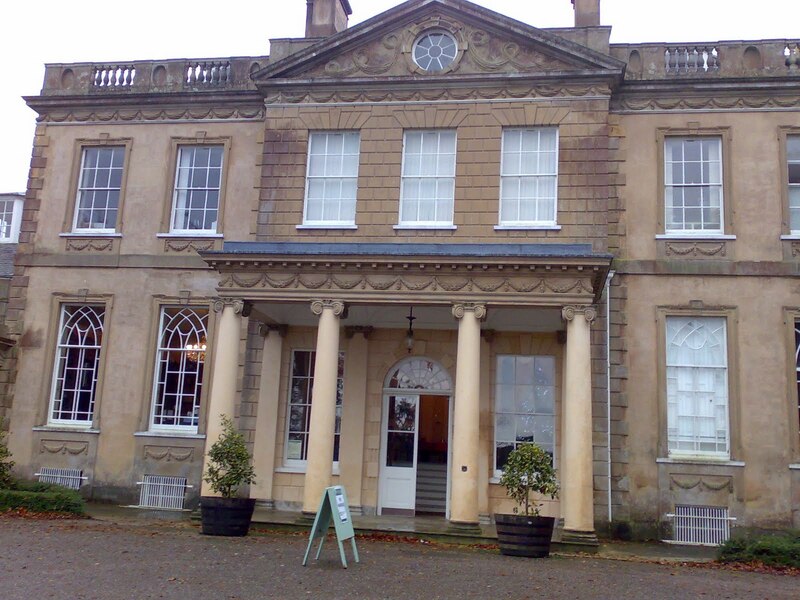 So there you are my new home, which currnetly is sat in a diveway in Dorset. 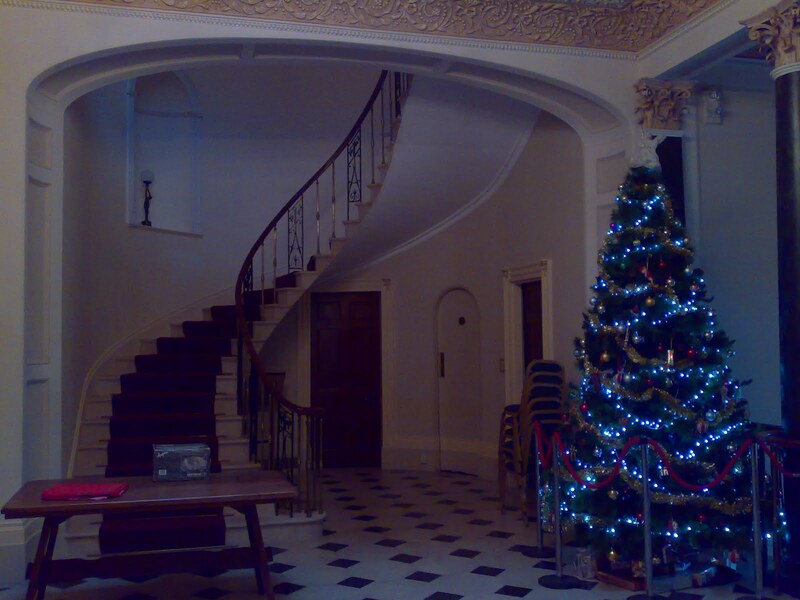 Today is another Christmas party and another talk. At least I got a lie in, love the van. Well several groups will be pleased to know I am feeling a lot better than I was. I'm not 100% yet, but I'm functional (mostly). Thursday was hectic, and rather stupidly I forgot to take any pictures. On the other hand I would have been tempted to a picture of their loo (it was stunning) so maybe it is just as well. It was an early start as I was the before lunch speaker for a local group. Travelling at rush hour in London isn't much fun. The venue though is a very rural looking church hall. It's amazing how close the country is to the edge of town. I managed to get the new van there OK, it's not a lot bigger than the old van but it has a huge turning circle, so it is taking a bit of thought in small hall car parks. I am sure I will get it sorted soon. 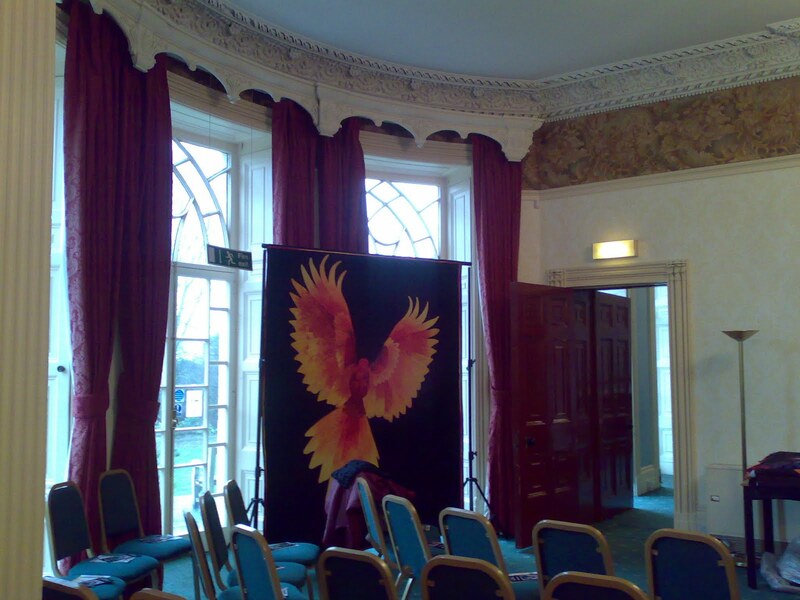 I was lucky to be able to get into the hall in good time so by the time the members turned up I was unloaded, set up and ready to chat to the members. I don't often get enough time to do this and I really enjoyed it. I hope the group did too. The talk ran to time and I found a few great helpers who made sure I was packed and out on time. Perhaps the promise of lunch helped encourage them, it certainly smelled good. Sadly I couldn't stay as I had a class at 1.30 in Hemel Hempstead. My regular classes are largely free form with students choosing their own projects to work on. This means I tend to get a mixture of very quiet lessons and manic ones. It just seems to work out that everyone needs help at the same time. typically the week I would have really liked a quiet class, I got a busy class. It was quiet fun though especially as one of the needy students was trimming up a top from one of my patterns to put on borders. 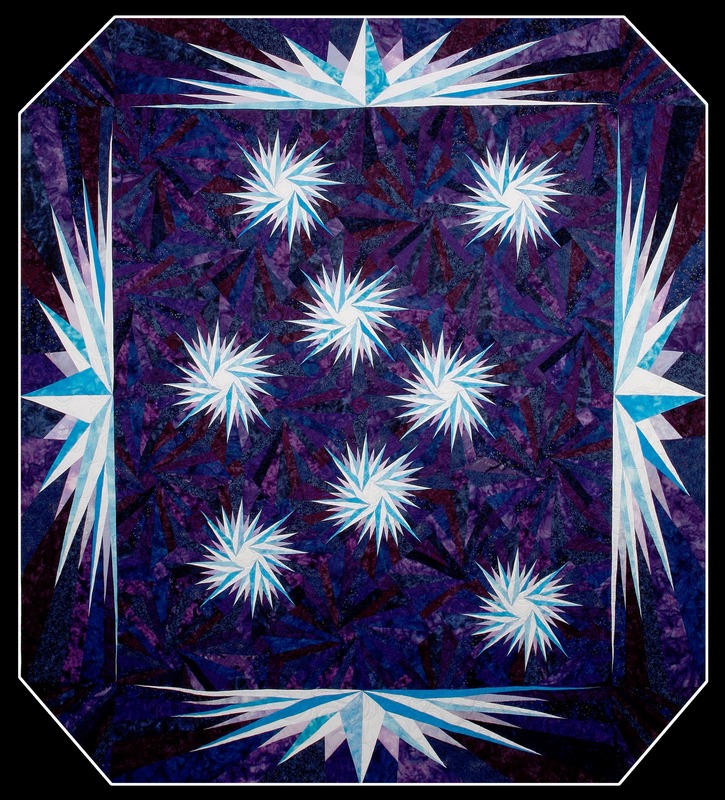 The quilt she is making is "Where is the North Star?" 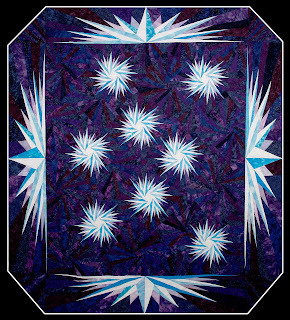 a quilt I made some time ago for a theme category in the Quilts UK show. Usually when you make a quilt the most work is in producing the blocks. The assembly is usually quite quick and easy by comparison. Like much of my work this quilt does things differently. You start by making the borders, they need the largest pieces of fabric for the border so it is safer to do them first. Then making the blocks is pretty simple and once you get into the swing of it quite quick. The work actually starts when you get to putting the blocks together. there are no rows and columns in the quilt all the blocks are put together using partial seams. It's not really hard but it is awkward and time consuming. Then comes the trimming. The blocks are all at an angle so you need to trim quite a lot off your top to get the right size for the borders, and you don't want to make any mistakes at that stage. Measure twice cut once? Not likely. I think we measured 4 or 5 times to be certain we had it right. It is looking stunning and I may have to get a picture of it soon. While I have been ill I've spent more time on the computer than usual and I've been looking at quilt patterns. I've had a few inspirations for new patterns and I like to know they aren't already out an about. It is amazing how often two (or more) people think of the same thing at the same time. In my lessons I've come across some really terrible patterns but there are some good ones out there and even some free good patterns. I'd like to share a couple I think would be good for people to try. These are patterns that I think would be forgiving and at the same time help improve your piecing skills. A lot of ladies struggle both with accurate cutting and 1/4" seams, so I am always on the look out for ways to cope with this but give you the chance to spot your issues. The first one that I spotted is Dueling Personalities, by Rebecca Silbaugh. The pattern talks about making two quilts but you don't need to make 2, just work with 20 fat quarters and off you go. It gives you a fair amount of cutting to do but don't let it put you off, the patterns talks you through it very nicely. I also like the way she makes her half square triangles, slightly over size then trimmed to perfection. 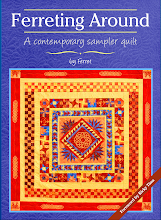 All in all a lovely quilt and a great learning experience. Another pattern I really like is Apple Crate by Angela. I like the fact that this quilt will give you a lot of scope for checking both your seam width and your pressing, but again will be quite forgiving. My only reservation is in using a jelly roll to make it. I think that you won't get a block A with matching rings from all jelly rolls. I think you need two strips of the same colour. Please check my logic as I am still not quite with it but as a quilt from yardage or fat quarters as suggested in the pattern it should be fantastic and quite quick. The last quilt that caught my eye was this one. Birchbark Lodge by Stacey Carey. This is really a quilt for someone who either has their 1/4" seam down perfectly or who is confident changing some methods used in a pattern. For me I would also make it bigger, but I like big quilts. I love the pattern. It's got a traditional feel and it's scrappy. What is there not to like? It has some interesting ideas in it and I can't wait to have a go at this one. Hopefully some of these will inspire you and you will forgive me for giving you somewhere to waste a lot of time. I think I need to head to bed. I've got an early start tomorrow for another Christmas Lunch. Worthing Patchworkers here I come. 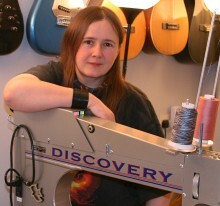 When I taught in Middlesbrough recently I met a lady with a Brother sewing machine. I wanted to send her some bobbins so she gave me her address. You've guess my problem haven't you, I've lost it. I've now had a good enough look that I am confident I'm not going to find it. So please if anyone can put me in touch with her, or point her at me I would really appreciate it. A comment here or the contact button to the right will get a message to me. Have bobbins and a jiffy bag, I just need to know where they should be going. When I know I have a lot of bookings in a row I really don't need to get ill. The universe generally seems to think it's the perfect time. Somewhere I picked up a cold, but I thought I was going to keep on top of it and I managed to pick up the new van and head over to Cambridgeshire. It was a bit daunting heading straight out to stay in an untested van but everything went well and the group were great. I hope at some point they will send me some pictures over. We worked on faux trapunto flowers for the workshop which went great guns until lunchtime :) After lunch things were a bit more laid back. What can I say, rural area with good food. Not only was my pack lunch fab (thank you so much for the piece of pie) the diner the night before was good too. I got very lucky and was staying with a motorhome owner. It might sound odd but if you haven't tried it you have no idea how much we love our homes on wheels and yes they really are homes. 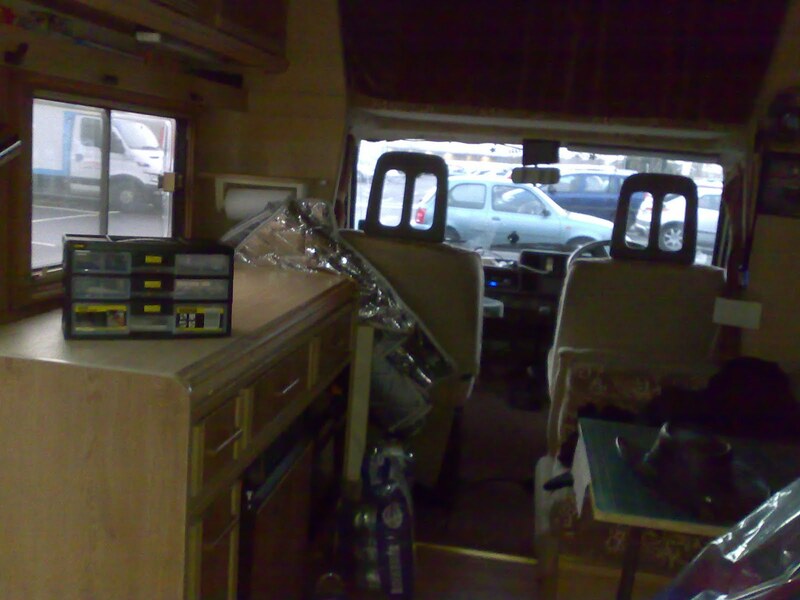 When I say I will stay in my van it isn't any hardship at all. In fact it is closer to being a treat. This particular household could even offer me electric hookup. Unfortunately not being familiar with the van I had to pass this time. 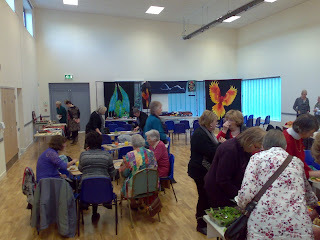 The next event was Art Quilts by Numbers at Patchwork Corner. That was a lot of fun. It had gone from undersubscribed to nearly full in the last week before the class and as I thought it would be a quiet class I had a couple of students doing the class for a second time. This means people trying other techniques and ideas which I hope makes for a more exciting class for everyone. It makes for more work too, but that wouldn't normally be a problem, when ill, it's not ideal. Since then I've mostly been ill. I've managed to get a few customer quilts done, the rest needed for Christmas will be done ASAP. I actually had to cancel a regular teaching day, which is rare but if I can't breathe or think I'm not much use as a teacher (or driver). Today is the first day when I have felt able to string words together that might make sense. I have managed to do some design work, I can colour in squares when ill, although the maths is a bit interesting and I am now largely redesigning the quilt. I'll probably be a bit quiet again till Thursday as I have a lot of paperwork and quilting to catch up with but then I will be taking the van for a better trial. I have 3 Christmas event s over 4 days. I can't wait. 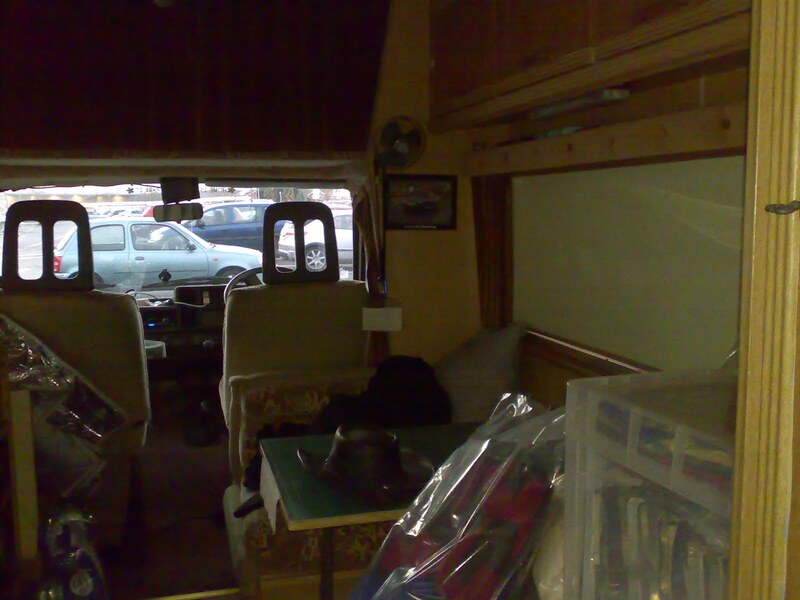 The van is now clean tidy and loaded up ready to go. 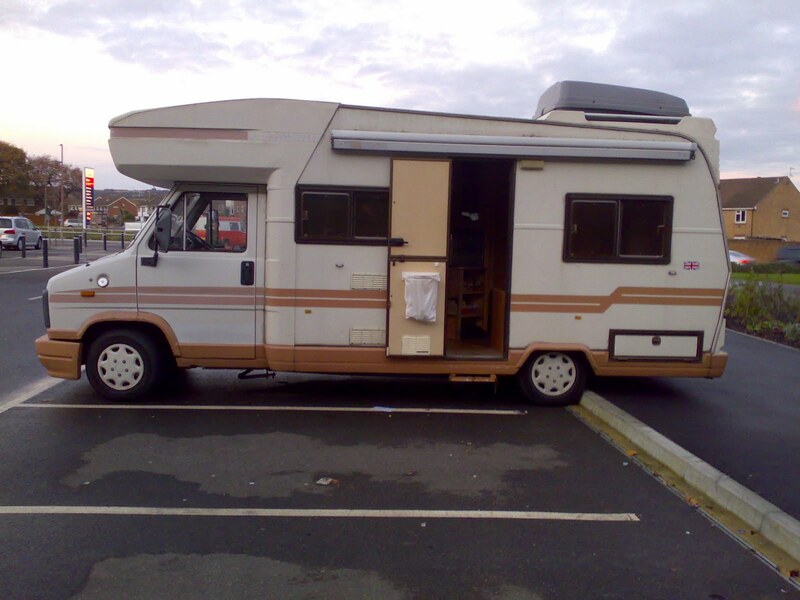 We just need to get the gas cylinders changed from butane to propane and I am ready to hit the road. Of course that is proving to be one of those simple jobs that is a lot harder to actually do. Although the new van uses much bigger cylinders than the old one did, they are still too small for our local suppliers. I know we will find some it's just a matter of time.